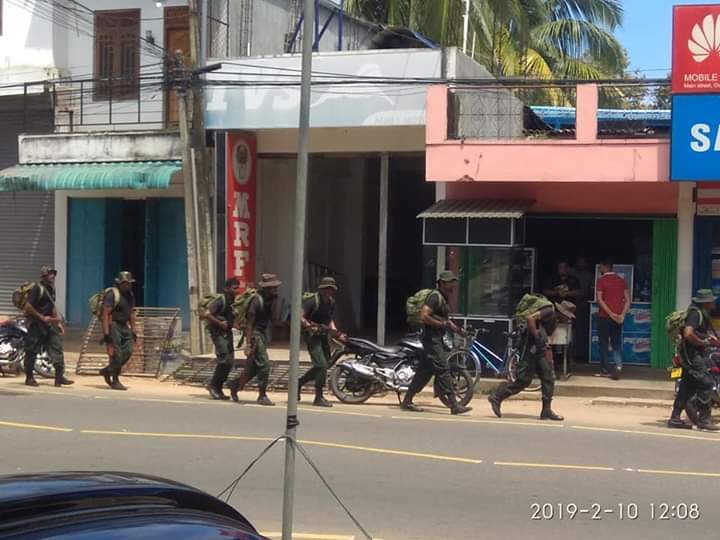 Sri Lankan soldiers patrolled in Batticaloa on Sunday, provoking concerns among locals who say that the district has already been under a climate of fear for months. Security forces had intensified their presence in the district since November when two Sri Lankan police officers were shot and killed. Two former LTTE cadres remain in detention under Prevention of Terrorism Act (PTA) regulations, and several others questioned, while locals and politicians have been vocal in denouncing the arrests and scapegoating of former cadres. There have also been ongoing tensions across the Eastern Province since the appointment of former UPFA MP Hizbullah as governor. Tamils and Muslim groups have denounced the appointment of the politician who is seen as communally divisive and corrupt. Protests across the province condemning Hizbullah's appointment culminated in two almost consecutive hartals, which Tamil and Muslim businesses and workplaces participated in. The protests have caused tensions between local organisers and police, who tried and failed to prevent a second hartal, and consequently arrested and detained an organiser. A planned trip by Sri Lankan president Maithripala Sirisena to Batticaloa was also cancelled at the last minute on Friday.